What I've learned in the past ten years as an active living advocate is that the car is a great tool, but a terrible master. In response the bike is a tool for optimism. Many of us in the US behave as if we don't have a choice about whether or not to drive a car every time we want to go someplace, even for very short distances. We act as if somehow our growing traffic congestion, smog, and car crashes are simply the price we need to pay for a modern society. But it's not true. 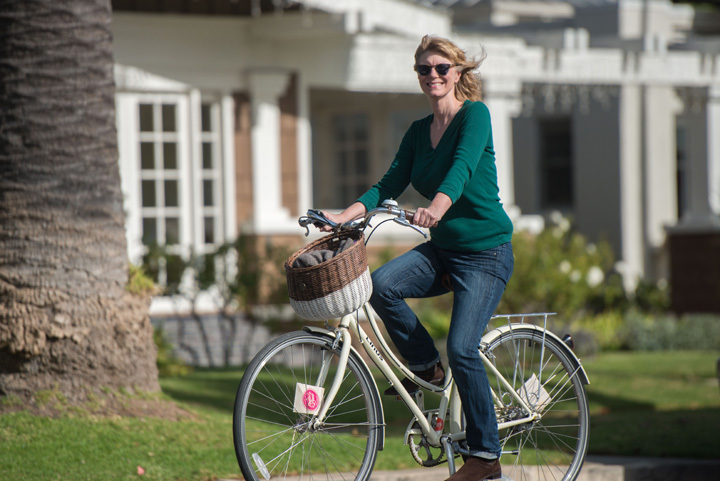 Amsterdam, Copenhagen, even Davis California (and many other cities around the world) have proven that the bike offers us one of the most elegant, affordable, healthy, and—most importantly—fun opportunities for fresh thinking about how we get around for our daily travels. Further, the worldwide Vision Zero movement, launched from Sweden, is giving us the research, data, and philosophy to rethink the way we move all forms of transportation on our streets to radically reduce the number of deaths and serious injuries. I'm a living example of biking’s possibilities. In December of 2009, I climbed on a bike again for the first time in over thirty-five years. I’ve been riding one regularly for errands, meetings, and recreation ever since. The delicious pleasure of the sun, breeze, and yes sometimes even rain on my face and the wonderful sense of accomplishment of getting around on my own power can't be overstated. But it took my friend (now my partner) Charlie Gandy six months to convince me to even try riding again. It wasn't that I didn't know how to ride a bike. I knew I did. I'd adored riding as a child and young teen. I'd also been watching the bike culture in my hometown of Long Beach California bloom all around me, but I didn't think I could participate. The block in my mind about riding a bike again was that I deal with ongoing chronic fatigue and pain challenges. Driving a car had become so stressful and expensive I’d given mine up in 2007 and found it much easier to walk and take the bus and train than I’d ever realized. But I simply didn't think that I could ride a bike any distance that would be useful or fun. I'd forgotten (as Steve Jobs knew so well) that the bike is a strength maximizer. For short trips it’s often easier, and even faster (especially when you take finding parking into account) to get places by biking over driving a car. Riding a bike again gave me a whole new lease on life both personally and professionally. The joy that I experience led me to connecting with others, not only in my hometown of Long Beach, but across the country (and around the world) who feel the same. I began to wonder, as someone passionate about the power of storytelling, what I could do to help share some of these inspiring stories of hope and transformation with a larger audience. And so, first PedalLove.org and then this book was born. Our goal in expanding The Surprising Promise of Bicycling for America from a report to a book is to give you an easily shareable format of inspiration. We want you to not only experience snapshots of what’s succeeding in growing bicycling from those with their hands in the clay, but to also give you great ideas and resources for growing bicycling in your own neighborhood, community, city or region.